10. Your idea of search is paging through your phone book. 9. You think an app is something you get as part of an Applebee's 2 for $20 entree special. 8. The only handle you have ever had was for your CB, not Twitter. 7. You think that CMS is an incurable yet mostly benign medical condition. 6. 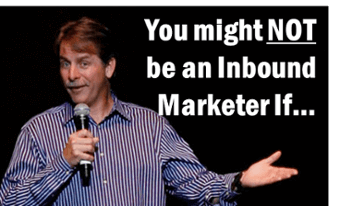 You're pretty sure that lead nurturing is something farmers do with baby chickens. 5. Your business doesn't have a website - well, because how much longer is this Internet thing going to be around - really. 4. You're willing to bet that that Call To Action is the national anthem for a small, European country you've never heard of. 3. Spotify is something you use to clean unsightly couch stains with. 2. You're certain the best way to build your brand and engage with your fans is through highway billboards. 1. You believe the best use of your ad budget is for a single, yearly Super Bowl ad - and nothing else.